Sunlight will slowly drift over the seamless stone walls, encompassing visitors in a silent shine to humanity. This cavernous space was the vision of Basque artist Eduardo Chillida (1924-2002). The actualization of his monumental work of art has been fraught with environmental, historical preservation and construction concerns. Today things are back on track and the Chilida Tindaya cavern is poised to be one of the most impressive achievements of contemporary art. A classically trained sculptor, Eduardo Chillida is best known for his abstract sculptures and monumental outdoor installations of steel or concrete. His art focuses on exploring space with elements twisting, curving, complimenting or opposing each other. I particularly like his “Wind Combs” series (1976) installed into the coastal rocks near San Sebastian, Spain which grasp like tense hands at the splashing waves. 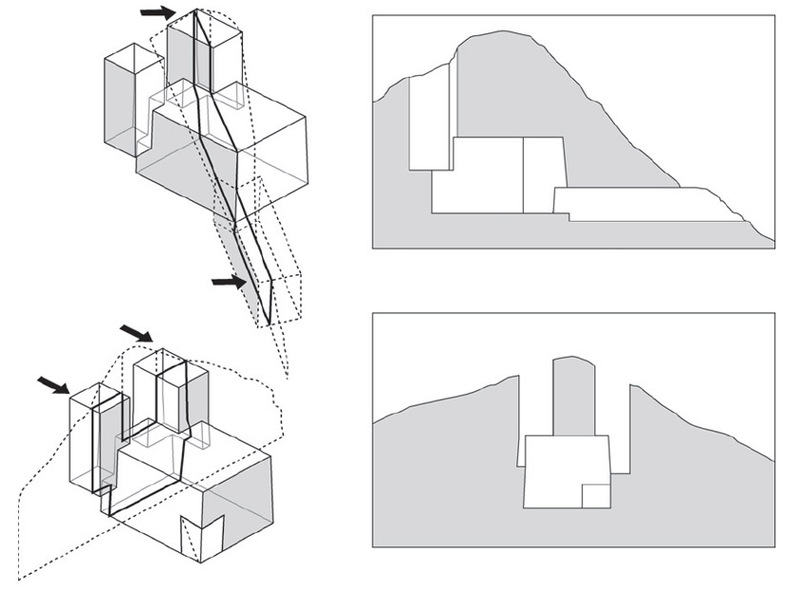 The “Monument to Tolerance”, or the Mount Tindaya project as it is now known, began with a conceptual design of creating meaning out of an empty space. The idea of the empty chamber generated by quarrying a mountain evolved into the purposeful creation and design of a tranquil, cavernous place. Within this room, one was meant to experience through two shafts, the light of the sun and moon as they cross overhead. Integral to this natural shrine was its location. After extensive searching, Mount Tindaya on the island of Fuerteventura in the Canary Islands was selected in 1994. The cavern consists of a central chamber measuring 65m long, 49m wide and 45m high. For some perspective, this is just larger than the Pantheon in Rome which is 43.5m in diameter. 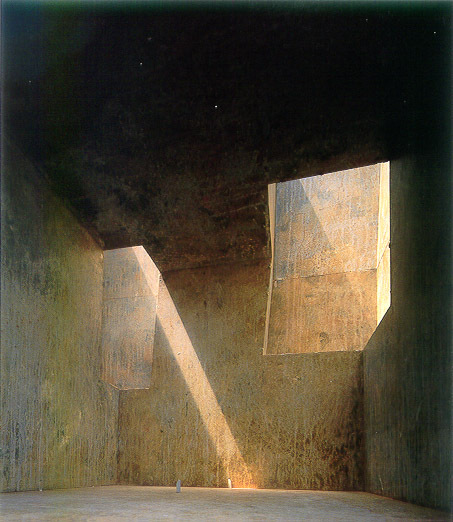 Chillida’s artistic design very clearly stated that the ceiling and all walls must be planar and made of the mountain stone as if carved in situ. The chamber is illuminated by a smaller (20 x 20 x 65m deep) and a larger (30 x 21 x 65m deep) shaft. Visitors enter the space through a 68m long tunnel across from the shafts and out through which one can view the ocean. In the rendered design video below you can see how spectacular the passage of time will be from inside the chamber. From ancient Greek temples to Gothic cathedrals, space has been a sacred architectural concept. The greatness of an open design and the feeling of smallness that it evokes, imbues visitors will humility and stillness. I think it was Chillida’s intent to give visitors a more global perspective in this natural, unadorned shrine. I can imagine that the slow movement of the light through the cavern will be a meditative experience, much like the color subtlety of a Rothko painting, for those visitors patient and open enough to watch. Achieving this strict artistic vision while planning for structural durability was no simple task. Several years were spent surveying the stone of Mount Tindaya and calculating if this project could be safely constructed. A flat roof would not be able to span the chamber and so the Arup engineering firm designed several potential hidden hanging roof concepts. 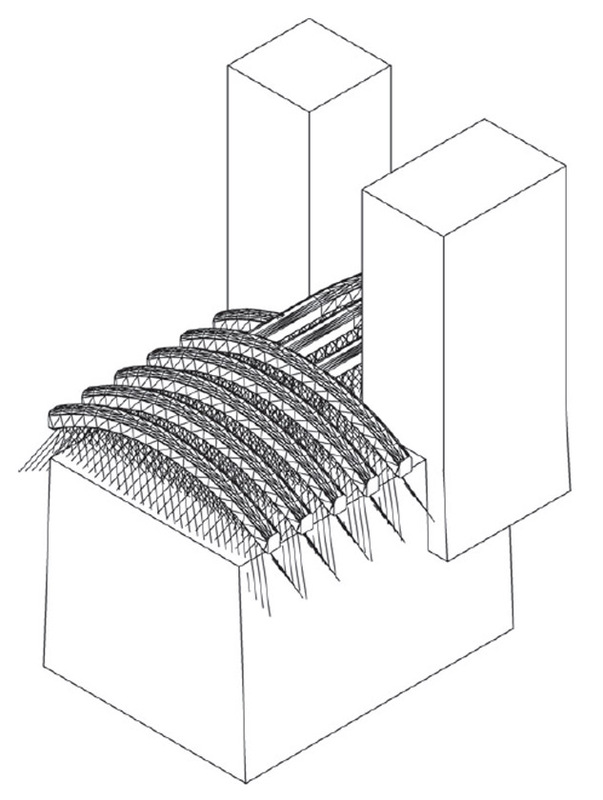 The final hybrid support design can suspend a maximum of 44.2 tons thus easily creating the desired “flat ceiling” effect. One additional hurdle for the project was minimizing the environmental impact of the construction and preserving the prehistoric carvings on the island. Fuerteventura has a fragile desert ecosystem; therefore, helicopters were used for all the geological surveying and all drilling material was captured so as not to damage the flora or resident species. 100 square kilometers around the entrance to the proposed Chillida cavern has been designated a protected zone and will eventually be made into a national park to further ensure the preservation of this land. Like the other Canary Islands, Fuerteventura has numerous Neolithic carvings. Construction will not reportedly interfere with these elements although some preservation groups are skeptical this can be realistically accomplished. As difficult as progress has been for the Moutn Tindaya project, I’m very excited that things are advancing and am looking forward to seeing the finished space someday. I think good art engages the viewer and standing in this space will be a wholly unique experience. As modern materials define our lives, this stone cavern is a connection back to the Earth and a silent respite for our harried lives. The Mount Tindaya project is a truly unique effort and will be an exciting architectural installation and surely an international “art destination”. While the Mount Tindaya project is not yet completed, you can still get flights to Fuerteventura now for a sunny holiday enjoying the beaches, desert and mountains. The government of the Canary Islands is still finalizing the project funding and determining a long term management strategy for the site. Construction is estimated to take 4 years, so you will need to go back to Fuerteventura in 2016. But it will definitely be worth it to experience the monument to light, stillness and space. This post has been sponsored by Fly Thomas Cook. However, content and opinions are my own.